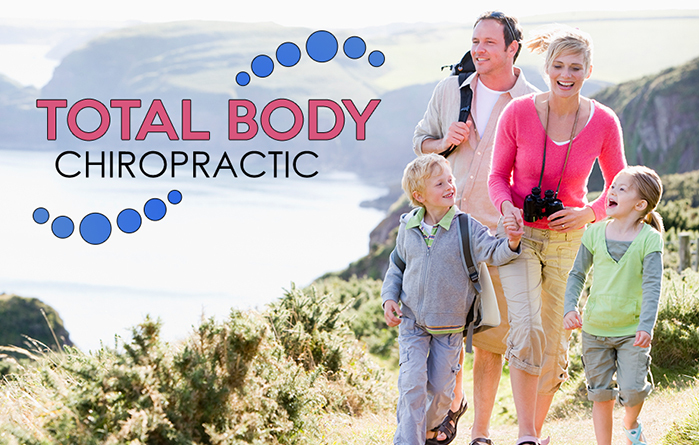 At Total Body Chiropractic, we believe that chiropractic care is essential and vital in obtaining your overall health and wellness. Chiropractic adjustments are designed to properly align the vertebrae of the spine. Chiropractic care restores normal body function and alleviates pain and discomfort. There are three things that cause spinal misalignments. These are thoughts, traumas, and toxins. Thoughts are financial concerns, doubts, health worries, stress, economic fears, anxiety, depression, etc. These can all cause a spine to become subluxated and have a negative effect on a person’s overall health. Traumas include sports injuries, falling down on a hard surface, auto accidents, etc. Traumas may be more subtle like missing a step going down the stairs, walking into the corner of a wall, or sleeping in an awkward position. Often it is what we do during the day or at our job that causes the symptoms and pain that has developed over time. Repetitive job functions, sitting behind a computer all day, driving for long periods of time, working a manual labor job, or factory work are common examples of ways of developing pain, discomfort, and a subluxated spine. Toxins are things we eat, drink, and breathe. Americans have an increasing diet of fast food, caffeinated soft drinks, artificial preservatives, artificial sweeteners, additives, processed foods, synthetically produced products, hormone fed chicken or beef, chemicals, high fructose corn syrup, and pesticide grown crops. We breathe polluted air such as carbon monoxide from car exhausts, drink polluted water, eat food stored in aluminum cans, and drink water stored in plastic bottles. The human body has never had to adapt to its toxic environment more than it does today. Chiropractic care helps with many types of ailments. Some people think chiropractic is only used for neck and back pain, but it does much more. Headaches and migraines can be treated effectively with chiropractic care. Every day, I adjust shoulders, elbows, wrists, ribs, hips, knees, and ankles for my patients. In addition, chiropractic is your first line of defense for any illness or problem you may have. A regimen consisting of proper diet, exercise, whole food supplements, and chiropractic care can address most illnesses and ailments that afflict today’s society. Prescription medication or surgery should not be your first option, it should always be your last option. It is critically important for an individual to get adjusted if they are feeling sick, because the immune system is weak and was unable to fight off the virus or bacterial infection on its own. Chiropractic care helps to prevent sickness by keeping the nervous system functioning at its optimum. By properly aligning the vertebrae and releasing any spinal nerve interference, nerve impulses and nutrients can flow unimpeded to the tissues and organs that they innervate. Since the nervous system controls all other systems of the body including the immune system, it is extremely important to maintain the nervous system with regular chiropractic care. In addition, my long term patients, who have been educated and know how chiropractic care maintains their overall health, understand and appreciate the value of ongoing chiropractic care in their lives. These patients make it a high priority to get adjustments on a regular basis, allowing their bodies to function at its optimum and making them feel extremely healthy and energetic.